It's a good month for the brokers at Fraser Yachts, as a call to the Fort Lauderdale office brings news that Jose Arana Jr represented both buyer and seller in the recent sale of the 31.4m motor yacht Marlena II, a joint listing with Thorsten Giesbert in Palma de Mallorca. She’s a classic example of 2005-built Overmarine Mangusta jet driven yacht and is stylish, fast and comfortable while always maintained to an impeccable condition with full certification. Contemporary accommodation is divided into four ensuite staterooms. With 2 large saloons, there's plenty of space for guests to enjoy themselves. An ample aft deck includes a dining table and sun loungers and the foredeck supports a shaded sun pad. 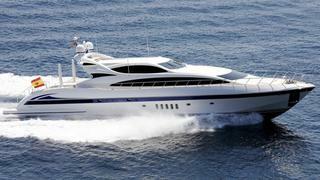 At over 30 knots, this superyacht runs very silently with a level of comfort not usually expected at such speeds. Marlena II was asking €3.45 million.